HLA journal (formerly Tissue Antigens) published the first article resulting from the collaborative effort of the EFI population genetics working group: an EFI labs based catalogue of Common and Well Documented alleles. The study compares this new catalogue with the former ASHI, and identifies a number of alleles that are not commun in Europe and others that altough common in Europe were absent form ASHi’s catalogue. The link for the paper is http://onlinelibrary.wiley.com/doi/10.1111/tan.12956/full and all comments are appreciated. A report of the Population Genetics/Anthropology session of the latest EFI congress in Stockholm has been published in the EFI newsletter of this month. The collaborative HLA-net study on a new HLA map of Europe was among the abstracts presented during this session, among many other very interesting talks. Discover more about this session and the rest of the congress in the newsletter. 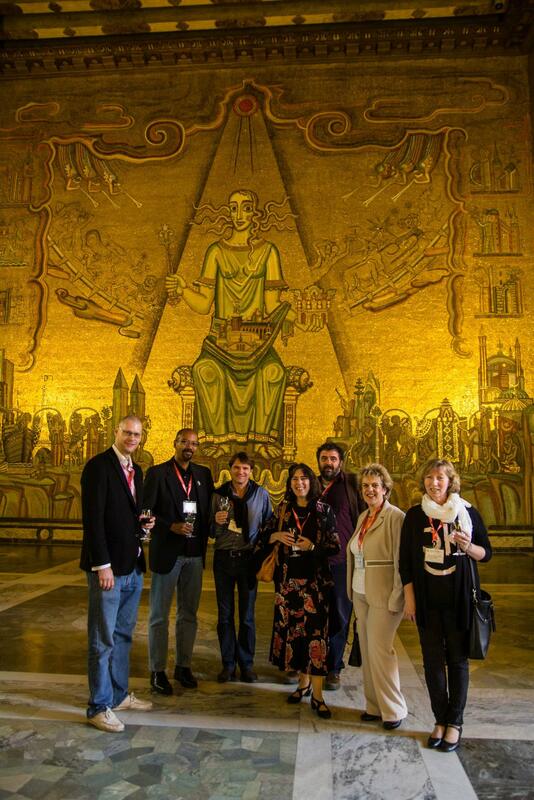 Including some social event pics like the one below at the Welcome reception in the beautiful and golden Stockholm City Hall. 15 laboratories of the HLA-NET BM0803 Action participated in this comprehensive study aimed at resolving three of the most common ambiguous group of alleles (HLA-B*44:02:01G, -DRB1*14:01:01G and -DQB1*03:01:01G) encountered during HLA typing. Almost 5100 individuals from 12 European countries were analyzed, providing the most detailed record to date on these ambiguities (relative ratios of alleles, linkage disequilibrium with other HLA loci, …). Because these ambiguities are due to polymorphisms located outside of the exons coding for the peptide binding region, they may not be recognized by alloreactive T-cells. However, because of strong linkage disequilibrium (LD), mismatches for these ambiguous groups are associated to DRB3-, and C-mismatches. These results are thus very informative for algorithms searching unrelated hematopoietic stem cell donors. Furthermore, the introduction of human leukocyte antigen (HLA)-typing strategies that allow resolving exon 4 (for class I) and exon 3 (for class II) polymorphisms can be expected to contribute significantly to population genetics studies. Vidan-Jeras, B., S. Buhler, V. Dubois, Z. Grubic, M. Ivanova, T. Jaatinen, D. Ligeiro, et al. “Resolution of HLA-B*44:02:01G, -DRB1*14:01:01G and -DQB1*03:01:01G Reveals a High Allelic Variability among 12 European Populations.” Tissue Antigens, September 1, 2014. doi:10.1111/tan.12422. A very interesting review article by Alicia Sanchez-Mazas and Diogo Meyer on “The Relevance of HLA Sequencing in Population Genetics Studies” has just been published in the Journal of Immunology Research. 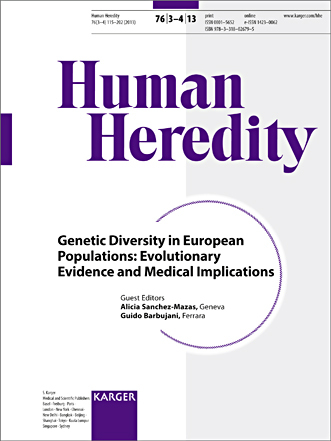 A special issue of Human Heredity entitled “Genetic Diversity in European Populations: Evolutionary Evidence and Medical Implications” has just been published. It has been stimulated by a scientific meeting held in Geneva, Switzerland, in January 2013 as the closing conference of the European COST Action (BM0803, HLA-NET), also supported by the Swiss National Science Foundation.